October asking prices of London homes rise the most in more than a year! Values in the city increased 7 percent from September to a record average 596,692 pounds (S$1.23 million), the biggest jump since October 2013, property website Rightmove Plc said on Monday. The gain left prices 0.6% higher than in May, when they were at their previous high, after falling in three of the previous four months. Some reports have indicated a loss of momentum in the London market in recent months after prices surged more than 20% in the preceding year, twice the national average, and Bank of England financial-stability officials took measures to prevent overheating. Shipside said demand is showing signs of slowing and may continue to weaken during the winter. Nationally, prices rose 2.6% in October from the previous month, taking the annual gain across Britain to 7.6%, compared with 7.9% in September. 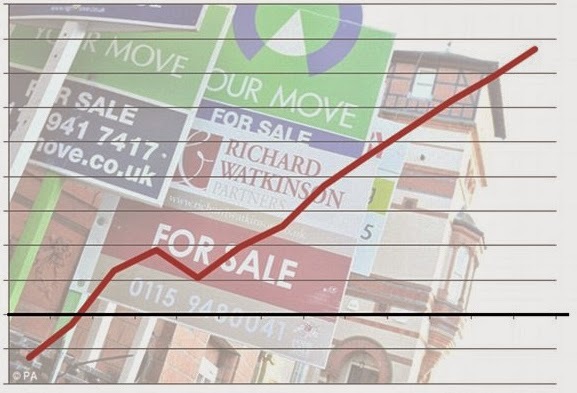 Out of the 10 regions tracked by Rightmove, seven posted monthly increases, led by London, while three saw declines. The southeast of England overtook London as the region with the fastest annual increase, with asking prices in the area surrounding the capital up 10% from a year earlier compared with the city’s 9.6%. U.K. gross home loan lending fell 1% to 17.8 billion pounds in September from August, the Council of Mortgage Lenders said on Monday. That’s up 10% from a year earlier. And even if there is indeed a bubble forming, it is merely a question of "getting out just before the bubble burst" for many of these investors... or rather, specuvestors. Please help us by taking our survey. Thank you! No Comment to " October asking prices of London homes rise the most in more than a year! "